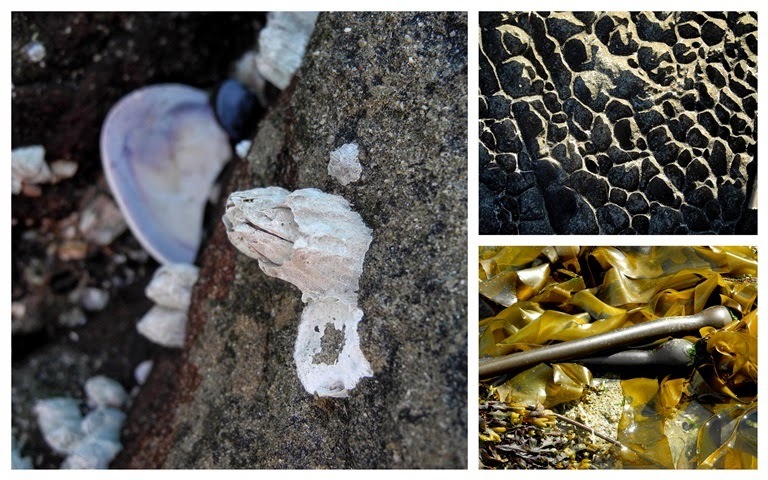 All sorts of textures are scattered throughout the intertidal zone. One day we, (Tim, his sister, and me) sat with our feet in a cooling tidal pool and watched. Tiny crabs, less than an inch across investigated my toes, causing the faintest tickle. Crabs chased each other - they seem to be very territorial. Most fascinating was observing the barnacle feeding - with its feet! The link takes you to a short article explaining just how it works. Stone worn by the water looks like a miniature landscape in the top right photo. Tangled ribbons of bull kelp line many beaches. Someone created this crooked little set of steps, probably with the aid of a chain saw. A random piece of man's inventiveness in the woods. Tim snapped this one from Solitude as Janet and I rowed the dinghy to shore. Doesn't it look like a blessing from heaven? We were certainly blessed by the beauty of creation and the good time we had. Many people have left evidence of their visit to Wallace Island by writing/painting/carving their boat name on a piece of driftwood and hanging it on the outside of this abandoned building. The inside is filled with more such pieces. No, we didn't leave our mark here. Perhaps next time. Linking to Mosaic Monday, hosted by Judith of Lavender Cottage Gardening. Your photos are lovely - I have a sense of the peacefulness of that little holiday. I rather like the idea of leaving a piece of driftwood there, much nicer then graffiti or carving into a tree....less invasive. I like all of the textures you included in your photos. I can almost feel the rock, the rough wood and the smooth body of water. Such a beautiful place you live in. I love the sign posts that all the visitors have left. Wonderful photos! Sea life is so intriguing. I love the photo of the sunbeam on your dinghy and the signs are quite interesting. They'd be fun to read too. I enjoyed your post; you and Tim are certainly making good use of your boat and seeing nature's beauty all around you. I hope you have a good week! That's a beautiful shot of the dinghy with the light shining through. And the steps are truly nice. Quite a little project someone took on. Love the shot of the light shining down. Interesting textures in the mosaic. A beautiful place and lovely images from your visit.. I like the driftwood signs, very cute idea. Have a happy new week! I like the waterside textures in the first mosaic, the crazy stairs in the middle of nowhere and the sparkling diamonds that surround you in the boat. Thanks for linking to MM. I would love rowing to this island paradise and dream of hanging out in that shack with signs of visitors. Your part of the world is so beautiful! What an amazing photo of you and your friend. I like what Deb said, Beam me up Scotty! This is a beautiful place to spend time. Love those steps! Hugs! I love those wonky stairs! It sure looks like a blessing from heaven! A gorgeous capture. Good job Tim. Wonderful images, Lorrie. The photo of the two of you with the beam of light coming through is amazing. Love the crooked steps! You are certainly enjoying a magical summer! Gosh Lorrie, you look like you had a wonderful time at the sea. My time in England is almost up and I'll have to return to Vancouver soon, and I cheer myself up by reminding myself that I live right beside the Pacific there. Hope you took a little driftwood home to remind you of your lovely holiday. What a legacy to leave your mark on a sign....the rocks are fascinating too. What a pleasant journey you shared. I would so enjoy dipping my feet in a tide pool and watching little crabs go by. Great photos. Seeing you in the dinghy on your way to shore brings back memories of summers past! Hopefully 'Seamist' will be shipshape for us this summer. Exploring and studying the sea life in rock pools is fascinating. Lovely shots for your album Lorrie, they will be good to look back on once winter comes - or shouldn't I mention that! Interesting crooked steps.....I imagine the artist had fun making them!